In order to help its patrons get in the holiday spirit, award-winning pizzeria Crust 54, which has two Holland, MI, locations, is now offering gift card specials and catering for large holiday parties. “Christmastime is a great time to get together with family and friends. We want to make it easier on everyone by providing the space, service, meal and drinks,” said Debbie Klaus, co-owner of Crust 54, a three-time TripAdvisor Certificate of Excellence recipient and People Love Us on Yelp 2017 Award recipient. During the holiday season and all year round Crust 54 will either deliver to holiday parties or host them. For parties of 15-19, a reservation needs to be made at least one day in advance, and food needs to be ordered at menu price at least three hours prior to arrival. Drinks can be ordered after arrival. Parties of 20 or more can order their own food and drinks at menu price and pay a venue rental fee based on the number of guests, or pay $15 per person, which includes a buffet with deep dish pizza, thin crust pizza, breadsticks, salad and fountain drinks (no venue rental fee required with this option). There is a two-week notice required to book a reservation for parties of 20 or more. Reservations are only at Crust 54 South Washington and not available before 7 p.m. Thursday-Saturday. For more information about large group reservations, please visit http://www.crust54.com/large-parties/. Crust 54’s current gift card special now through Dec 31 states that if customers spend $50 they get a $20 voucher for January-February, and if they spend $100 they get a $40 voucher for January-February. Crust 54 can deliver for large parties within five miles, and can accommodate approximately 45 people indoors. Crust 54 specializes in savory, authentic Chicago-style pizza, and is known for its original Chicago-style deep dish pizza. They also offer gluten-free pizza crusts, appetizers and salads. 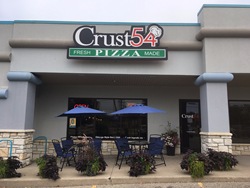 Crust 54 has two Holland, MI, locations: 54 E. 8th Street downtown and 1145 South Washington Avenue, both of which offer outdoor seating, online ordering and Wi-Fi. For more information, please call the downtown location at (616) 394-3002, the South Washington location at (616) 848-7787, or visit http://www.crust54.com.